That’s my signal to head over to the DuPage Children's Museum in Naperville, Illinois. Located at 301 N. Washington Street, the museum is within walking distance of downtown Naperville. There is never a shortage of hands-on interactive learning experiences for both big and little kids. One of our favorite exhibits is Bubbles. 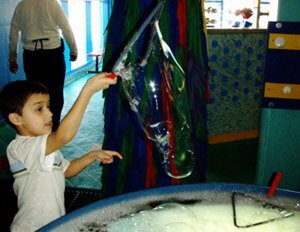 There the kids can use a variety of bubble wands to make gigantic bubbles! There is even a special place to trap yourself inside a bubble! Another favorite is AirWorks. We love to wear goggles like a real aviator and navigate our way through the wind tunnel…we take props like colorful scarves in and watch them react in the wind! 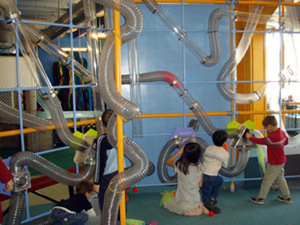 We also have a blast experimenting with the many tubes throughout. 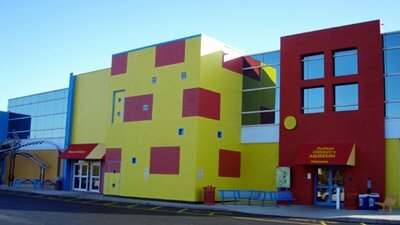 Whether you are looking for something to do on a rainy day, or the kids tell you they are bored, be sure to check out the DuPage Children’s Museum in Naperville for some fun and learning!